I have just heard of a wedding taking place this summer which is to cost £55,000, a shocking expenditure in my opinion. But will it be any more festive than some of the weddings that took place between 1863 and 1870, uniting various members of my family then resident in Merioneth, North Wales? The most striking difference between then and now is the close connection between the local community and the gentry, among which my forebears could now count themselves. The villagers hung out flags in honour of the occasion; if they could not afford flags, they hung out their coloured handkerchiefs. If the bride was local, they built decorative arches under which her carriage rolled towards the church. These were covered with flowers and greenery, and carried banners wishing the couple well, in Welsh or English. Children strewed the church path with flowers. Throughout the day, rounds of rock cannon were fired off. This was a custom peculiar to North Wales. Take a chunk of rock, bore some holes in it and fill these with gunpowder. Fill a goose quill with powder to act as a fuse. The resulting explosions illuminated and reverberated round the slate quarries. In the evening neighbours lit up their windows with candles and there was a bonfire. 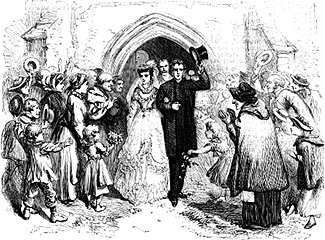 Mr John Casson’s wedding took place just before Christmas 1863 in the bride’s home village in Essex, so the main local celebration was to greet the couple when they returned on Christmas Eve from a short bridal tour. A whole crowd met their carriage, unharnessed the horses and led the couple round the square in front of the Hotel, then off up the road and through an evergreen arch, to the family home. Mr Casson made a speech, in English and Welsh, assuring his listeners that although ’Mrs Casson could not speak to them in Welsh . . .she had promised him that she would try to learn the language’. The consensus was ‘that a merrier Christmas Eve was never seen in Festiniog’. For that wedding, there was a dinner for the Casson household and farmhands, buns and oranges were distributed to all the schoolchildren, and half a pound of tea to each of the most deserving poor. For his niece Mary Casson’s, in 1869, her parents laid on a ‘sumptuous luncheon’ for the wedding guests, a dinner in the farm-yard for tenants, workmen and neighbours, and a dinner of roast beef and plum pudding for the inmates of the workhouse at Penrhyndeudraeth, followed by evening tea. The following year, Mary’s brother Thomas Casson married the daughter of a retired Welsh sea-captain, who lived like a squire in the nearby village of Talsarnau. He laid on a grand supper for all his workers and families, and a tea-party for nearly 200 schoolchildren. When the couple returned from honeymoon – the word was in general usage by then – there was an evening of music and speeches in the school to honour them, and the bride was presented with a handsome Bible and a celebratory ‘address’ engrossed on vellum. These descriptions show up the sharp divide between rich and poor – which a welfare state was no doubt expected to eradicate. But in these small Victorian Welsh communities, those who had either been born, or raised themselves, into the gentry, clearly enjoyed and were honoured for carrying out some social obligations.